Java Unconference in Crete. Day -1. Tomorrow I’ll be joining about 60 other Java folks and 20 members of their families in Crete – the largest island in Greece. This is the third annual Java unconference that takes place here. If someone is not sure why savvy Java developers STILL go to conferences I’ll tell you – to attend parties. Of course, attending technical sessions is also useful, but this alone doesn’t justify spending several thousand dollars on technical sessions alone. JavaOne organizers are very good at offering free video recording of all presentations almost immediately after the conference’s over. So if you’re attending conferences just for the technical sessions you’re either wasting your time or are a speaker. You have to meet people at the conference. Don’t want to? Stay home and watch recordings on Youtube. Three months ago I went to Kiev, Ukraine to attend the Java conference called JEEConf. Why? First, Kiev was my home town many years ago. Second, I made two presentations there. Third, after one of my presentations I spent an hour talking to Ukrainian Java developers in the corridors besides attending a couple of parties. I love talking to people who share my interests – Java in this case. Why I’m in Greece now? Last year at JavaOne I’ve attended (you got it!) a party where I met Heinz Kabutz. If you’re a Java developer you must have heard about his Java Specialists newsletter. In my opinion, this newsletter is the most advanced periodical about Java. Heinz told me about his unconference and invited me. I gladly accepted. The word unconference means that the agenda is open. As of today, no one of these 60 people knows who will present and what will be the agenda. As far as I can guess, on Monday morning attendees will express their interests and vote for topics to discuss. I would assume that there will be some stickers on the wall where people will write their subjects of interest (I’ll let you know how this actually have happened after the fact). During the flight over Atlantic Ocean I’ve decided what to put on my sticker. Will people want to discuss these topics? Will they want me to present on any of these topics? I know as much as you are. I can share with you one fact though. 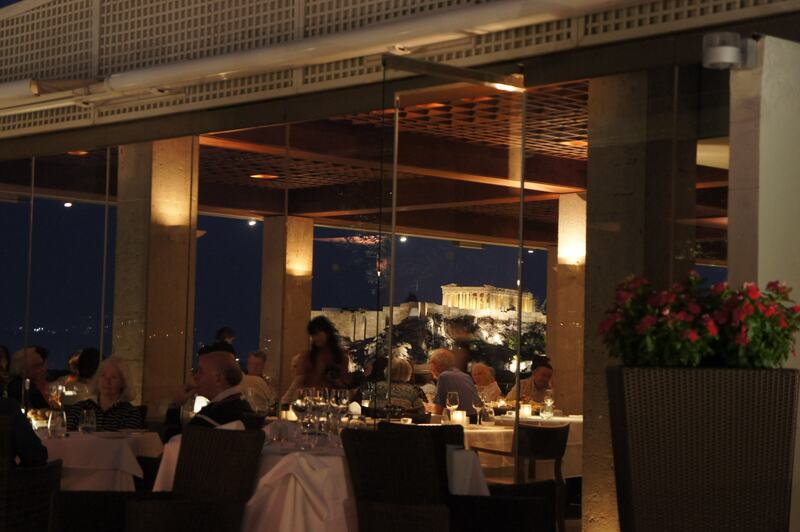 Yesterday, I was dining in Athens in this restaurant with a great view of Acropolis. This should be a really nice vacation. I’m here with my wife, the technical sessions will last till noon, and after that people and their loved ones can enjoy the sea, the beaches, and the Greek hospitality. Next Java Unconference in Crete. Day Zero. Yakov, your quote “You have to meet people at the conference. Don’t want to? Stay home and watch recordings on Youtube.” I have a question. I suppose must people from IT don`t like communicate “offline”. All those “red-eyes” developpers, system administrators etc. I think they prefer communicate using internet. I can`t believe all those people can change their minds on conferences and have many new conversations with many NEW people etc. Maybe there are most commercial people there who sales their products, not technical? They like communicate. Please, correct me. The fact that people are communicating mainly online via social networks is damaging for their minds and twenty years from now we’ll have a generation of zombies that will be unable of talking to real people. There is nothing better that talking to peers in the real world. This is what conferences are for. It’s not worth spending hundreds or thousands of dollars to fly to a conference, sit at several presentations and fly back home. Youtube presentations are free, Devoxx subscription is only a $100, JavaOne presentations are free. Why are you going to software conferences? Thanks for answer. I did mean, are those all people who communicate (not only watch presentations) on conferences developpers and other technical people or they are salesmen generally? I accept with your idea that old good live communication is better than online, but I told exactly about those special people, geeks. Are they have participations on those conferences? I think it`s hard for them to communicate. Thanks. Agree with Anatole. Just came back from the dinner in a room full of excellent Java developers. They are great at talking about the things they know and like – their profession. They are smart, sharp and open to any new ideas presented in a logical and convincing way.